I mentioned a few times before how special Gỏi is and how different it is than salad here and here. This particular dish has a rather special place in my heart because I once lost some seriously chubby, Asian poundage eating it every week for about 6 months [insert legal disclaimer] as part of a healthy, balanced diet that included plenty of exercise. After many failed attempts at low-carbing, de-toxing, Atkins, etc., I realized that white people’s diets were not going to work for me. I looked at my mom and my cousins and saw that they kept their trim figures by eating healthy, Vietnamese food and by getting out and moving about everyday. They didn’t deprive themselves of food they liked but they understood and practiced portion control and moderation. Another thing they didn’t have was a guilt complex with food. If they had a high calorie or fatty snack/meal, they would enjoy it and balance it with other healthy food and exercise. Make your dressing by smashing the chilies and garlic in a mortar and pestle. Add the sugar, lime, fish sauce and water. Mix thoroughly to dissolve all the sugar. Taste and add more sugar/fish sauce/lime according to your preference. Set aside. Using a sharp knife, cut the cucumbers in half lengthwise or and if you have a Japanese Mandoline, use that to then slice it into thin half moons. Add them to a large bowl and toss with the salt and sugar. Allow to sit for at least 1/2 an hour. The salt will cause the cucumbers to weep their water. 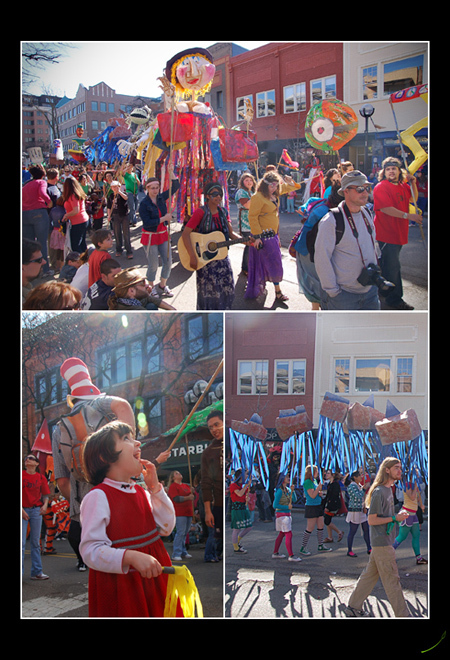 I want to leave you with a few photos I took on Sunday in downtown Ann Arbor where the 2008 Festifools took place. FestiFools brings students and community volunteers together to create unique public art (mostly large, papier mâché ) that is free and accessible to everyone. It was a glorious day with blue skies and warm weather. You can also view some fabulous photos from the festival’s official photographer, Myra Klarman, here. Huh! I think we have the same family. Gotta love the VNese philosophy of being blunt b/c they love you. You know, as opposed to friends who only say nice things about you. Goi diet I have not tried. Of course, this is low carbing it as well. Hmm. If I drop 30 lbs, I think you can trademark it. omg i SO know what you mean about the vn being blunt! whenever i return to my home town to visit i always get the stare down to see if i’ve gained weight or lost weight and i always get the “you look like you gained weight!!”. i am a mom now so i don’t get as much time to prepare vn food anymore but you’ve just inspired me to try to make more of an effort to make goi. i’ve forgotten how much i love it and i could shed some of this left over baby weight! “Diet” salad or not, this looks tasty and will definitely be entering into our normal weeknight menu (although I’ll have to switch cashews for peanuts.) It has so many of the flavors that we both love, and it looks like it would be a great dinner for weeknights in front of the baseball game. This looks wonderful – I was just thinking I wanted to make a Vietnamese salad for dinner tonight, inspired by a recent trip to the Slanted Door, in San Francisco. I was thinking cabbage and jicama, but this sounds great, too. Do you have any other favorite Vietnamese salad recipes? Yes, let’s get some branding material together and trademark this! $19.99 is a deal, man. Seriously, I don’t believe in diets that restrict because I feel trapped by them. They may help to shed some pounds in the beginning but the results aren’t long-lasting because I can’t restrict myself from x,y, or z forever. Snowypeach5- Thanks – the salads are a great way to eat healthy and interesting food. As WC says, when they say “You look like you’ve gained weight,” it’s their way of showing you love. Right??? This looks so good!! I was just telling Lenny we need to make more asian inspired food and then I opened up your very nice comment – and this is what we found. A party in our mouth! YUM! That salad sounds both tasty and healthy! Love the Dressing! It is so different from the usual olive oil and vinegar. I am known to have bad habits when it comes to diet. I just…don’t eat! Bad! I know! No matter what, I’m always the chubby one in the family because of my bigger bones. They “remind” me of this to help me become “skinnier”, but they feed me like a starving beast,”You’re chubby, but…why didn’t you eat my cooking?”. What the?!? You’re salad is perfect…it has flavor, protein, crunch and freshness. I could eat this everyday….alongside a bowl of hot steamy rice! Chubby power!! How fun the festival looks and I’m so happy that the weather was wonderful! 30 pounds!!!! Ok, I am converted. 🙂 Quick question, how do you poach your pork/shrimp? Denise – Thanks – it does look quite festive, doesn’t it? Warda – no, no. That’s crazy to not eat. The only time I didn’t eat was right before my wedding (nervousness, I guess). WORC – I know! Gotta love our fams. The weather was nice that day but then it’s back to gloom and doom now. 😦 It’s a good thing we got out when it was good, though. Mandy – Yes, it’s hard to believe, but sadly, very true. To poach the chicken/pork/shrimp, I cook it in barely simmering water until done (rather than a strong boil). I think it results in a much more tender texture. Thanks for asking! Your food looks so good, you might inspire me to start cooking again! I could stand to lose some weight I gained from working to hard and not exercising! Looking forward to meeting you and Pierre again through the FestiFools show. You are really the master of salad! Being so creative in selecting the ingredients! Well done! Myra – Thanks so much! Festifools rocked our world! Your photographs are spectacular – great perspective, great composition and all-around fun. p.s. Your website and blog are so well designed – they really reflect your fun personality. Love them! Mycookinghut – Oh, gee, thanks! Looking forward to seeing more of your awesome pics from your trip on your blog! You’re right: eating everything in moderation and moving. This was the only way I finally lost 50 pounds (from pastry training and sampling). Fresh veggies, seafood, not too much meat and plenty of getting about, that’s waht workd for me so I can have my cake and eat it too on the weekend. This salad is going in my to-do list! P.S. Love the blog — I find a recipe I want to try in almost every post! I am a cookery teacher. I try this recipe for my class. I show them how to fry the cracker using the chopstick. Then you take a spoon of the salad and put in the middle of the cracker. They love it so much. The combination of cracker and salad makes you feel sasticfied. I can not believe I found this website. I must be home. I can totally relate to every comment on this site!